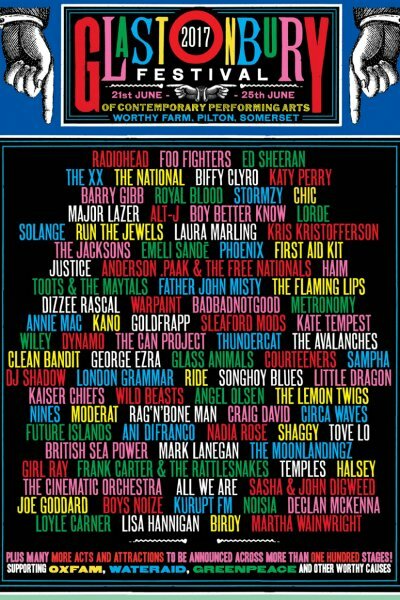 Day three of the Glastonbury Festival at Worthy Farm in Pilton, England is in the books with performances from a host of veteran and modern artists, including a headlining set from the Foo Fighters. Alison Moyet reached back four times in her fourteen song set for music from her time with Yazoo (Yaz), playing their four biggest British hits. Also included were three songs from her upcoming album, Other, three from her last set, The Minutes (2013) and a smattering from Alison's other solo albums. 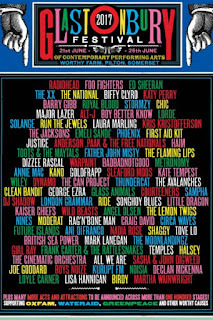 Liam Gallagher gave his Glastonbury audience some new music debuts as well as his first time ever solo performance of his brother’s Oasis classic Don’t Look Back In Anger. Don’t Look Back In Anger, originally from the 1995 Oasis album What’s The Story Morning Glory, was written and sung by Noel Gallagher. Liam made it his own at Glastonbury. It was the first time Liam had ever sung his brother’s song. Liam’s setlist was used to launch his first solo album As You Were, due later this year. He played six songs from the album, making up half of his Glastonbury set. The other six songs were Oasis songs and all from the first three Oasis albums. The Foo Fighters closed day three of the festival with a twenty song set that included at least one track from all nine of the band's studio albums including their upcoming Concrete and Gold.